Continuing with the fo’s of 2011. Kids had been longing for oversized beanies. 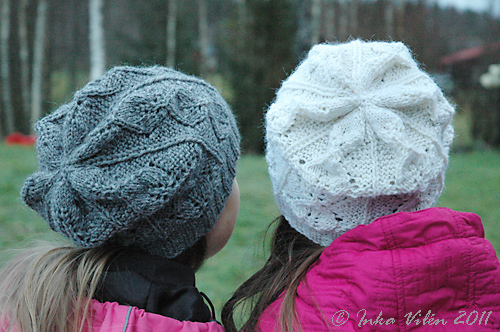 Once Villapeikko published her Sirle beanie pattern in Ulla 3/2011, I immidiately went shopping for yarn. The detail that I first caught my eye in Sirle, was the ribbing that was shaped with short rows in order to make the ribbing narrower in the neck and wider in the front. Kid wanted a white beanie, just like in the pattern, so that’s what she got (Ravelry link). I bought a skein of Laurin villalanka, which I had never knitted before. 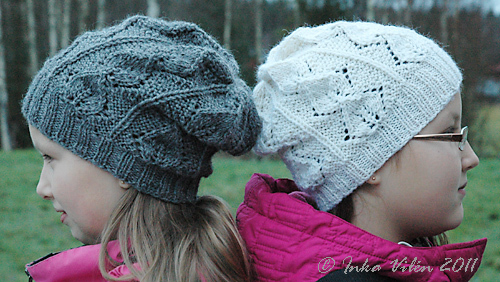 Using needles of 3.5 mm, the finished beanie took up 71 grams of yarn. It didn’t turn out as oversized as I (or to be exact, kid) expected, but yet it was worn a lot over the winter. For kid number 2, I also bought a skein of Laurin villalanka but in grey. I used 3.5 mm needles again and did everything exactly like in Sirle number 1, but still the beanie turned out more of oversized kind, and the kid was quite happy with the result. 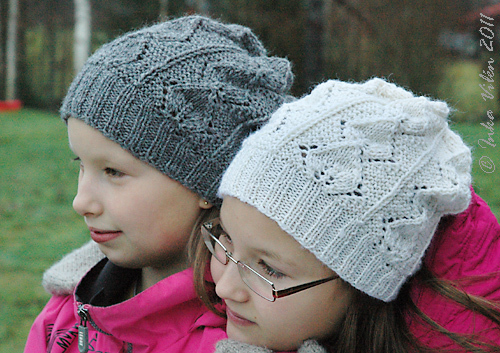 Kids loved these beanies, and I loved knitting them. That makes Sirle a perfect pattern, doesn’t it?